First brought to life as a television flick starring Tim Curry in 1990, Stephen King's arguably most renowned novel made it's way to cinema screens for the first time last September to rather outstanding results, scooping up $700 million in global earnings to rank as the horror genres highest grossing effort. Such accolades don't go undeserved - thanks to a superb script, haunting visuals, and a fantastic lead performance by Bill Skarsgård, It ranks as a terrifying yet thoughtful tale, far from afraid to censor the novel's key thrills whilst also never forgetting the complex story behind it all. Certainly one of the best horror films I've seen in quite a long time, and one fans of the genre must make checking out a huge priority. Tommy Wiseau's masterpiece of bad filmmaking The Room remains an icon to many - and so a film based on it's development, in turn adapted from the 2013 memoir of the same name, was inevitable for sure. James Franco finds himself helming and starring in this retelling of Wiseau's adventures throughout his films' bizarre production stages, and while Franco's own re-enactment of some of The Room's most infamous scenes are not always as faithful as one would hope, his overall effort in capturing the detail and depth to each character in such a story is inspiring for sure. 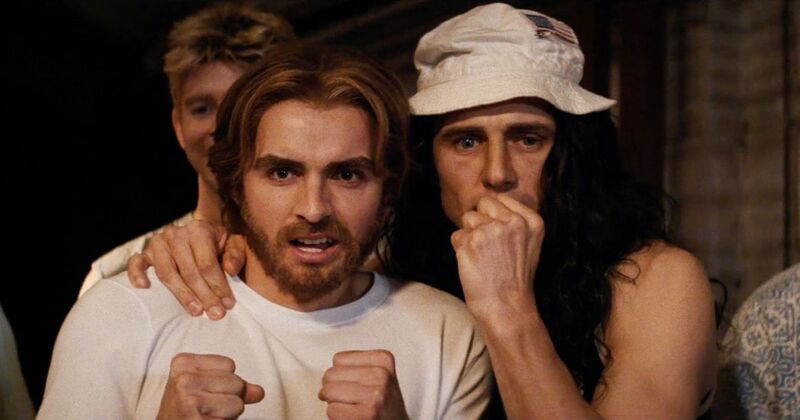 Ranking as a humourous yet surprisingly deep story, The Disaster Artist is also an admirable and reasonably faithful effort to retell a strangely iconic part of film history. Paddington, released back in 2014, raised initial concerns of being a beloved childhood character being forced into a silly modern, pop culture riddled story simply to cash in on the appeal and earn a quick buck for needy film studios. Thankfully, the final product was a loveable and superbly told family adventure, and this all carries over into the sequel with equally fantastic results. With our titular hero once again brought to life with superb visual effects and rich voice work from Ben Wishaw, what also makes this another loveable watch is of course the superb blend of tender emotions and big laughs - we're left once again with a film apt for wide range of audiences in almost every way, only building upon the many successful merits of it's predecessor. Again, I had to see this first before making this list - it may have not even made it on, but based on it's overwhelming critical success, I had a major feeling it simply would. Alas, Coco certainly stands tall as one of Pixar's very best efforts, let alone one of the best films of last year, showing how the studio has yet to lose their touch when it comes to crafting beautifully original stories that help prove animation still has the potential for complexity and emotional depth - not just ranking as colourful silliness to keep the kids quiet. It succeeds in pretty much every key category for sure - it looks gorgeous, has a handful of memorable songs, and a rich narrative that has the courage to explore deep themes in an approachable manner, leaving it a heartwarming masterpiece for all age groups. The Planet of the Apes series recovered from a downward spiral with it's 2011 reboot, which revitalised the central story with a well told origin tale featuring some of the most exceptional motion capture CGI effects seen in a modern blockbuster. 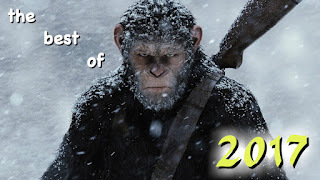 Last year's War for the Planet of the Apes brought the central trilogy to a close, despite potential for more sequels, and everything you'd expect from a closing installment is met in this emotionally stirring yet still suitably epic sci-fi hit. Alongside remarkable special effects, it's the lineup of fine performances that also help bring a well structured story to life in the best way possible, notably Serkis as ape leader Caesar once more and Woody Harrelson as our intimidating villain, simply known as the Colonel, who lacks the amount of screentime one may expect from a major foe but this somehow doesn't prevent him from remaining a thrilling antagonist. All this coupled with gripping yet never overly excessive set pieces leave this a superb finale to a fantastic story, maintaining all the positives of the previous entries and treating us to a lot more to boot.